This chapter provides detailed instructions on how to install and configure an SMPP service provider connection for SMS messaging using the Ozeki NG - SMS Gateway software. As you can read on the Service Provider Connections page, you need to install and configure one or more service provider connections for SMS messaging using Ozeki NG - SMS Gateway. One of the service provider connections supported by the software is the Short Message Peer-to-Peer (SMPP) connection. The SMPP protocol can be used to connect your computer directly to the Short Message Service Center (SMSC) of the service provider. This way you can send and receive SMS messages over the Internet or over a private IP network. To select the SMPP protocol, click the Install link in the respective entry in the list (Figure 1). When you have installed the SMPP Connection, the Configuration panel will show up on the right of the interface. The first tab of the panel is the SMPP settings tab. First, specify the SMPP server settings. This information is provided by the GSM service provider whose service you have subscribed to. The connection parameters are the host name (sometimes only an IP address is given), the port number, a username and a password. Service providers often use the phone number of the service or the port number as the username. Enter the information in the respective edit boxes (Figure 2). Then, specify the telephone number assigned to this connection and the service provider connection name. To facilitate identification and to avoid confusion, you should name the connection after the GSM service provider. E.g., if you have set up an SMPP connection with Vodafone, it is advisable to name it "Vodafone". Also, note that different connections should be given different names. If you have different connections from the same service provider, you can use different but similar names for them, e.g. : "Vodafone1", "Vodafone2" (or something of the like). However, some load balancing solutions require an identical name for different connections. For details, visit the Load Balancing and the Load Balancing for SMPP v3.3 page. Note that the phone number to be specified in the Telephone number edit box is a mandatory value. If you leave the edit box empty, the sending will be unsuccessful. You should check at least the Log sent and received messages in human readable format checkbox, as logfiles can be useful in debugging communication problems (Figure 3). In the Number of rotated files text box, specify the maximum number of rotated logfiles that are saved. Specify this number by entering a positive whole number. By default, the number of logfiles that are saved is 4 (see Figure 3 above). In the Connection tab of the Configuration panel, you can define detailed protocol-specific options and specify NPI and TON settings (in the left section) and you can make communication link management settings (in the right section). By selecting either of the radio buttons (v3.3 or v3.4), you can specify the protocol version. You can specify the system type by entering its name in the System type text box. The system type is for assigning the protocol standard of the other side (SMSC). It is specified by the service provider. To specify the bind mode, select one of the three radio buttons: Transmitter, Receiver or Transceiver. The bind mode describes the way of communication between Ozeki NG - SMS Gateway and the SMS Center of a service provider. Select Transmitter if you use this connection only for sending SMS messages. Select Receiver if you use this connection only for receiving messages. Select Transceiver if you use this connection for both sending and receiving messages. In this section you can also find boxes for NPI and TON settings. NPI is short for Network Protocol Identification. TON is short for Type Of Number. In each of them, you can enter numbers. This information is provided by the GSM service provider (Figure 4). In the right section of this configuration panel you can manage communication links. At first, in "Windows size" line you can increase the window size, if your SMPP service provider supports windowing. You can also check the Slow down communication to checkbox (you can provide the exact time in MPM) if your service provider cannot accept messages at a high speed. 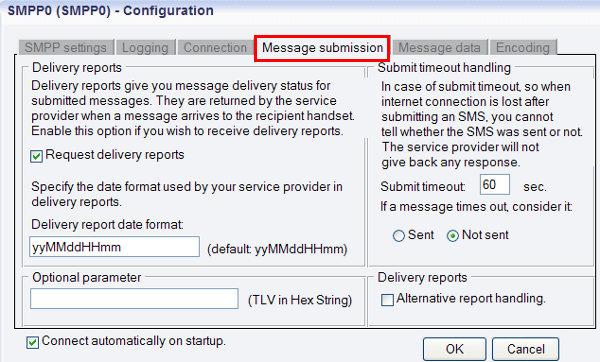 In Message submission tab there are two sections: Delivery reports and Submit timeout handling. In "Delivery reports" section you can enable Request delivery reports option. Delivery reports give you message delivery status for submitted messages. They are returned by the service provider when a message arrives to the recipient handset. Then specify the date format used by your service provider in delivery reports in Delivery date format line. In Submit timeout handling sector you can specify the preferred way to handle submit timeout. In the Submit timeout edit box you can specify the maximum waiting time for an SMS Center response confirming that your message has been successfully submitted. Successful submission means that the SMS Center has accepted the message for delivery. You can specify the waiting time by giving the number of seconds in numerical characters representing any positive whole number. If you are content with the default specification (60 seconds), leave this edit box unchanged. Select Retry later to make the program try to send a message later if the SMS Center has not confirmed its status as sent. Then, the message will be placed last in the outgoing message queue and sent out again when it is its turn (Figure 5). In Message data tab you can see two sectors: "Character encoding of text messages" and "Message data transport" (Figure 6). First, you can specify the preferred character set (Default, ISO_8859_1, UCS2, GSM7bit) and the character encoding policy (Best match, Transform, Enforce). Then you can enable one of the following options if it is required: Use GSM 7 bit packed encoding, Encode @ sign as iso 8859-1 character, Convert incoming GSM 7 to iso 8859-1. In "Message data transport" section you can enable segmentation and reassembly (SAR), to automatically split outgoing messages and reassemble incoming messages if needed as long messages should be sent through the mobile network in several parts. The last tab is Encoding in Configuration panel. There are the following sections: ESM Class field, Number format encoding, DCS field, Service type. In case your service provider ask you to set ESM class field to 00 for all messages, please make sure the following options are NOT checked. In Number format encoding section you can specify TON and NPI numbers; in the other two section you can specify DCS that determines the charset, the message class and binary message encoding, and service type parameter of SUBMIT SM PDU (Figure 7).